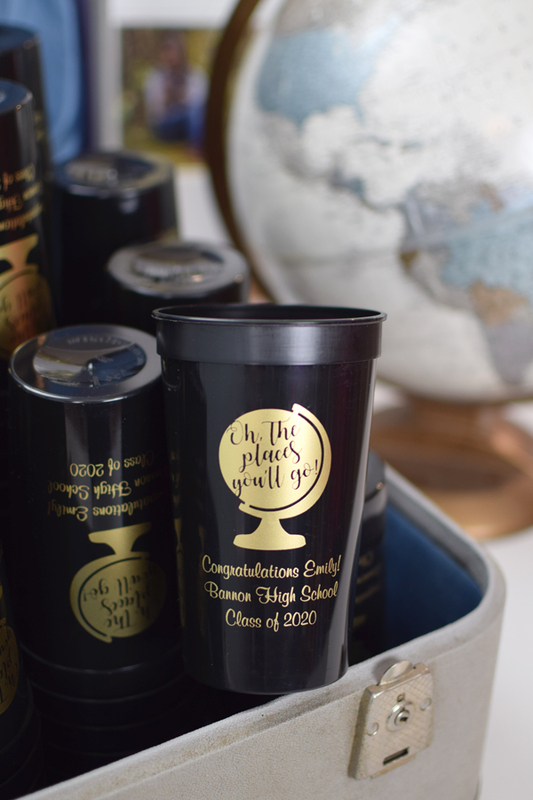 A great size for outdoor parties and for serving iced drinks, celebrate your milestone graduation party with custom printed, reusable 22 oz plastic stadium cups. Perfect for sending guests home with party souvenirs. Personalize the front and back of your cups for no additional charge. 22 ounce stadium cups are available in 8 cup colors and are top-rack dishwasher safe. Personalized with a graduation design and your own custom message. A larger cup that is great for holding iced tea or soda, each cup measures 5 3/4 inches tall by 3 1/2 inches in diameter. These are perfect! Great customization! Arrived as scheduled. Thank you! These cups turned out beautifully! When I received the proof I asked to change the font. Molly said that it would be no problem and sure enough in two days I had the new proof! So pleased with the product, the customer service and the value! So I ordered these cups for my graduation party coming up in May and after I got the proofs I noticed that the proof was missing a symbol and I asked that it be fixed it was litteraly fixed in an hr. And so they said they would start printing them the next day. I ended up having to call them to ask if I could add an extra set and they added the new set to my original order no problem and I got them on the day they said I would and it was honestly the best experience I’ve ever had with a customization company. I will definitely order from them again. I really wish I could post a picture. Cuz the cups are so cute! Love them!! They are perfect keepsakes for all of graduates friends! Very very nice quality and very nice print! I am in love with them and may order 50 more. Ordering was easy and I had the product within two weeks. Great customer service as well. The customer service was fantastic! My cups arrived quickly and were perfect. I would highly recommend this company!! They came out so awesome, thank you and the colors I chose were exact to the picture..i will def. be ordering again . Great product, speedy delivery. I will definitely use this company again. Bailey at Tippy Toad was very helpful and patient on my design as it was changed a few times. The cups look great! Ordering was easy and delivery was earlier than I thought. I ordered these cups for my daughter's graduation party and they are perfect! The colors turned out great and they are the perfect size to fill with party favors. Quick shipping! Will order again and have passed your website on to friends and family! These cups are so cute, perfect for a fun gift for for the guests of my sonÃ¢â‚¬â„¢s graduation party. I canÃ¢â‚¬â„¢t wait to set them out! Can't wait to use them for my son's graduation party. Great product fast shipping changed the stuff I didnÃ¢â‚¬â„¢t like when they sent me the proof. Helped me space it right canÃ¢â‚¬â„¢t wait to order again. Oh my gosh these cups are SO awesome!! I purchased the 22oz cups. Very easy to place my order! Called customer service to ask question & they were very friendly and helpful. I received my order much quicker than I expected and they came well packed in the box. Great quality cups! We cannot wait to use these at our son's graduation party!! We ordered the 22oz personalized cups for my son’s graduation party. I attempted to go with the school colors of red and blue. I’m very thankful that after my order was placed a representative from the company reached out to explain that the colors that I choose wouldn’t work well together. If they had just processed the order who knows what I would have received. I changed the order and was very pleased with the results. The cups were great quality and looked fantastic! I would definitely recommend this product and the company. These were the hot of the graduation party! They looked great, work in dishwasher and got here in great time! I got the cups in the mail the day after my son’s graduation party. So here I sit with a post-party mess and great cups that I have no one to give them to. TippyToad Response: Order was shipped on time and delivered on via UPS delivery method chosen by customer during checkout. An order status email with a scheduled delivery was delivered to the customer upon order receipt. TippyToad received no indication that the order was needed before the scheduled date by the customer. Very easy to place the order. Called customer service and they were friendly and helpful. The cups came looking great. They were packed well. I received them quickly which was great. My daughter was so happy to have the special cups for her graduation party! 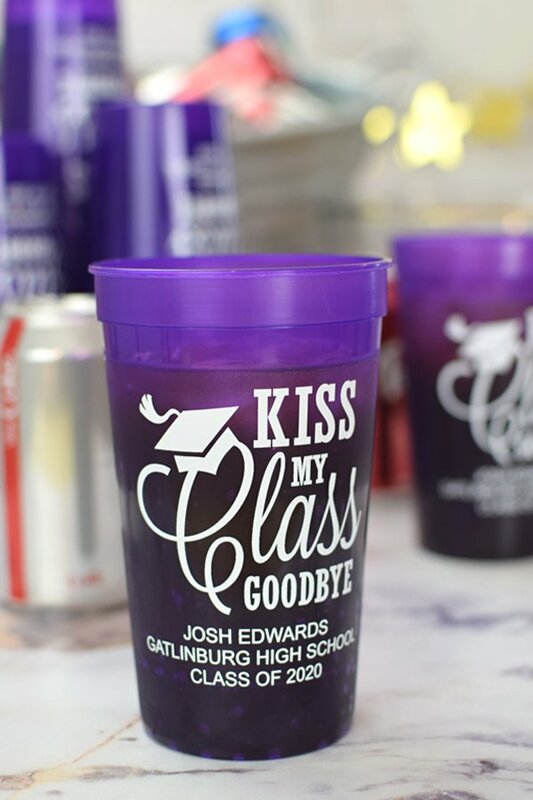 Ordered these customized cups for my sons graduation! It was a quick turnaround round with good quality. Will defiantly use them again! Great quality products. Great price. Very fast turn around and delivery time. I was super skeptical about ordering these as I saw the ad on instagram. I decided to take the chance as the price was great! The cups came in and were awesome!!!! They were bigger than I had thought and the company was so easy to work with! I'm very happy with the cups that I've ordered they came out so good! !